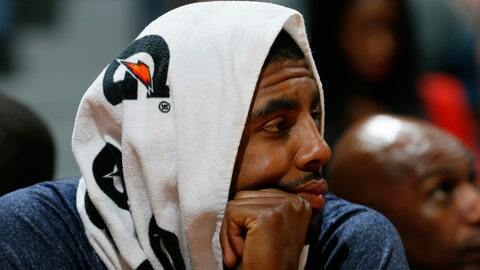 Kyrie Irving missed practice on Thursday with the flu. INDEPENDENCE, Ohio — Cavaliers guards Kyrie Irving and Dion Waiters sat out Thursday’s practice, coach Mike Brown said. Irving was sick and Waiters suffered from tendinitis in his right (shooting) wrist. The status of both for Friday’s home game against Milwaukee is to be determined. Irving has started all 24 games for the Cavs and leads the team in scoring (21.1 ppg) and assists (6.0). Waiters is second in scoring (14.9 ppg), coming off the bench for all but nine of his 22 games. He missed two games earlier this season with a cold. The Cavs (9-15) and Bucks (5-19) are scheduled to tip-off at 7:30 p.m.
"They’re a team that’s kind of in transition," Brown said of the Bucks. "They’re still figuring out the direction they want to go with their team. Obviously, [they have] a new coach. They’re still relatively young. They’re a team that plays hard and has been in a lot of games." The Cavs have won five of eight overall and four of five at home.